The Principality of Liechtenstein was established within the Holy Roman Empire in 1719; it became a sovereign state in 1806. Until the end of World War I, it was closely tied to Austria, but the economic devastation caused by that conflict forced Liechtenstein to enter into a customs and monetary union with Switzerland. Since World War II (in which Liechtenstein remained neutral), the country's low taxes have spurred outstanding economic growth. Shortcomings in banking regulatory oversight have resulted in concerns about the use of the financial institutions for money laundering. Liechtenstein has, however, implemented new anti-money-laundering legislation and recently concluded a Mutual Legal Assistance Treaty with the US. The Capital of Liechtenstein is Vaduz. An alternative spelling is Lichtenstein. 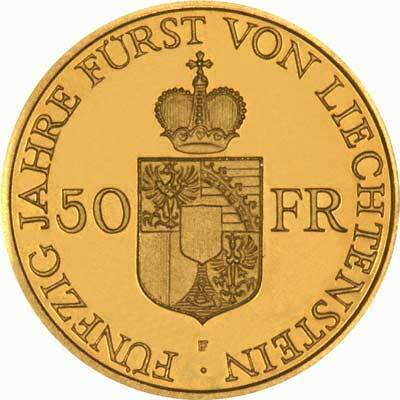 Any gold coins issued before 1921 conform to Austrian standards, and are denominated in Kroners (Coronas or Crowns). Those issued after 1921 follow Swiss denominations and standards. 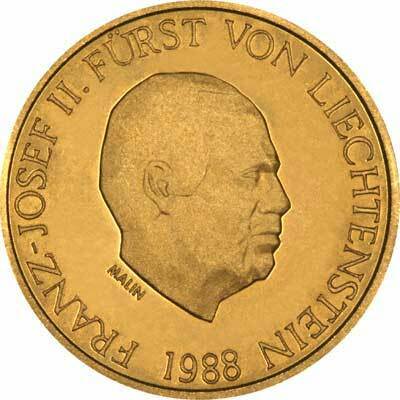 Technical specifications of the most frequently encountered Liechtenstein gold coins. For silver and base metal coins of Liechtenstein, please look at our original Chard Coins website.